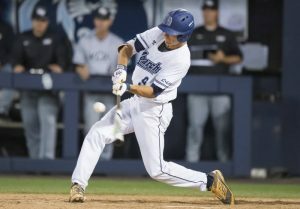 Jared Young played at Old Dominion University this season and received 3rd team All-American honors and All-Conference C-USA. Jared is from Prince George but went to play with the Okanagan A’s in the PBL. He first went to Conner State JUCO prior to transferring to Old Dominion. He was drafted in the 15th round by the Chicago Cubs as a 2nd Baseman. Clayton Keyes also went in the 15th round and was taken by the Arizona Diamondbacks. Clayton played with Team Canada’s Jr. National team and is a member of the Okotoks Dawgs organization. Congratulations to you and your families on your accomplishments and we all look forward to tracking your development and success for many years to come. BLE “Pivetta Watch”	2017 Bandito Camp Underway!